Searchable library of job description templates to help with updating and writing job descriptions. Ability to publish custom job description guidelines and processes to create consistent job descriptions. Job competency list determined by company to ensure consistency across all company job descriptions. ADA (Americans with Disabilities Act) tool that assists in creating ADA compliant job descriptions. Submit request for new job description or job evaluation through centralized system. Ability to communicate with all levels/positions involved in the job description process. Assign roles including creation, editing, approval and more based on reporting hierarchy. Assign deadlines to roles for each step of the process to stay on schedule and reduce delays. Create custom permission access to individuals based on role in submission and approval process. Ability for all roles to view and make comments in the system throughout entire process to streamline communication. Ability to track all versions and revisions of each job descriptions (current and in-progress drafts). Ability to tag job descriptions as "in-progress" or "final version" to ensure the most current job descriptions are being used. Ability to compare two job descriptions at once to find inconsistencies and edit documents more efficiently. Archive, search and retrieve all prior job description versions with time stamps to view the progression of the position. Access to a central folder in the system where all job descriptions marked “final version” are located for quick and easy access. Ability to upload attachments to the job description that provide additional/updated information needed for the position. Easily integrates and communicates with common HRIS tools (Taleo, iCims, Kenexa-Brassring, Successfactors, Jobvite, Greenhouse, Lever, etc. ), including custom fields and formatting, for easier reporting and tracking across all platforms. Easily integrates with payroll software to manage compensation data and ensure all positions are being compensated equitably across the company. 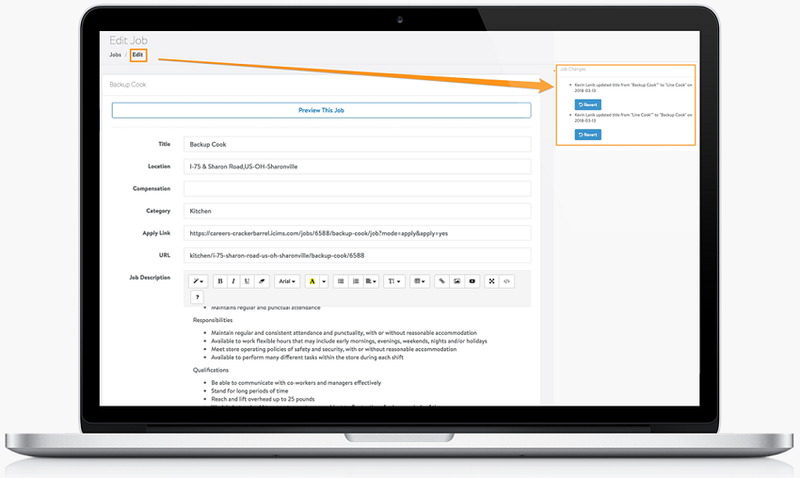 Ability create, store and integrate more than one JD across various HR information systems to view all jobs in one job code quickly and easily. Ability to pull reports on metrics to identify trends and activities (new job evaluation, job re-evaluation, results and budget impacts) throughout the company. Create custom reports and set up automated reporting on a custom schedule to access critical data. Create a custom hierarchy for each business division, establishing multiple levels and sublevels for a variety of positions and reporting structures.